Sonos Playbar review | What Hi-Fi? Sonos has always done things its own way. It doesn't care about bouncing beams or 5.1 surround sound. When the Playbar, the first Sonos soundbar, originally came out, there was nothing quite like it - and there still isn't. We've always applauded and respected Sonos for being different. But there now are plenty of similarly priced rivals, including from the company itself, so it's time to reconsider. While the claims that the Sonos Playbar introduces ‘hi-fi sound’ to your TV are little over the top, as this review will make clear, this is a very nice sounding unit, and while it’s simple, it does a heck of a lot more than most soundbars, too. That’s because, at heart, this is a full Sonos unit. That means it gives you access to massive amounts of streamed music. This Sonos soundbar will play everything (except hi-res audio tracks) that you’ve got stored on your computer or NAS device; you can send audio directly from an Android or iOS phone or tablet; and it connects you to internet radio and millions of tracks via Spotify, Tidal, Deezer and more. Despite the fact plenty of other players have entered the wireless, multi-room market, the Sonos proposition remains a very compelling one, thanks to a slick interface and a willingness to support new features and services. Of course, you can buy a simple Sonos One if all you want is lots of music. The difference is that the Playbar also connects to your TV. Disappointingly, there’s just one way to do this, and that’s via digital optical cable. This has advantages in terms of simplicity – all of your devices stay connected to your TV as normal and you have just one cable connecting the TV and Playbar – but it’s not as neat as those systems with multiple HDMI inputs and a single HDMI output for video. And while optical outputs on TVs are pretty common these days, they haven’t been for that long. You definitely want to check if your TV’s got one before forking out on a Sonos Playbar. The Sonos Beam has since launched with HDMI, should you prefer a Sonos TV speaker with this connection. If you do take the plunge you’ll start to consider it money well spent as soon as you take the unit from the box. This is a really nicely made and minimally styled unit that blends in neatly. It can be wall-mounted using an optional £35 mount or laid flat in front of your TV, with the built-in accelerometers automatically sensing the orientation and adjusting the sound accordingly. MORE: Sonos Beam v Playbar v Playbase - which is best? We have a couple of little warnings here: firstly, to us the Playbar sounds best when oriented with the wider edge facing out, so even if you’re not wall mounting we’d recommend standing it on the thin edge if you can. If you do go for the standard laid down orientation, you also need to be aware that the Playbar’s feet don’t lift it very high, so it won’t straddle a TV pedestal in the way the Yamaha YSP-2500 helpfully does. Set-up is dead simple using the Android or iOS app, which takes you through adding the Playbar in the same way as any other Sonos component as well as taking you step-by-step though the connection process. One neat little touch is that tucked away with the other connections is a pair of ethernet sockets, which allow you to connect other components, such as a smart TV, to the internet via the Sonos network. And talking of neat touches, the IR sensor means you can teach the Playbar to respond to the volume controls of your TV’s remote, and there’s even a repeater built in so that all of your remote’s other instructions get to your TV, even if the Playbar is in front of it. Unlike the newer Sonos Beam, there's no voice control option here. You'll need the Beam if you want Google Assistant, Alexa or Siri. The big question, of course, is how the Sonos Playbar sounds, so we kick off (excuse the pun) with a spot of Premier League football. Within just a couple of seconds it’s clear that this is a massive improvement over even the most impressive-sounding flatscreen TV. The width of the soundstage that’s created is mighty impressive, and there’s detail, weight and tonal balance that a TV on its own simply can’t deliver. Having said that, it seems Sonos has gone for a sound that’s more atmospheric than full of impact. It sounds as if it’s firing sound upwards rather than out into the room and to the listening position, especially if you’ve laid it flat. That seems more of a design decision than a fault to us, but it does mean the presentation is a little less involving than it could be. Switch to Ed Harcourt’s beautiful The Cusp and the Wane and that trait is still evident, but at the same time the sound is impressively detailed and dynamic, and that means you get all of the natural emotion of the track, even though it’s just a streamed MP3 from Spotify. Switch to a lossless rip of James Blake’s Limit To Your Love and the good news continues, with detail levels benefiting from the rise in bit-rate, and the separate strands of the track inhabiting their own space in the soundstage while fitting together to create a unified whole. The Playbar is capable of going pretty darn deep for a product of its type, too, although it does struggle with the very lowest bass note on the track. The fact that it even gets close is impressive, but if you want to hear even those near sub-sonic notes you do have an option – add a Sonos Sub. Adding the Sonos Sub to your system via the app is a simple process that includes a couple of steps for trimming levels so that it blends successfully with the Playbar, and the sound clearly improves with its addition. Not only does it mean the system can now reach James Blake levels of bass with rousing power, it also adds weight to big movie effects and helps the whole presentation fill the room more thoroughly. It’s all gain then, but its gain that you have to pay a great deal for – and given the Playbar’s level of quality in its own right it’s a stretch that only the wealthy or very dedicated should really consider. If you do fit into one of those categories you may want to go even further and add two Sonos Play:3 speakers to create an even more immersive system. 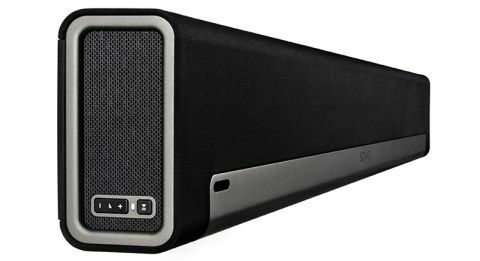 The Sonos system can decode Dolby Digital or produce pseudo-surround from a stereo signal. But it's a shame the set-up can't handle DTS or any of the higher quality soundtracks such as Dolby TrueHD – the latter due to the limitations of the bandwith of the optical connection. It's also worth noting that many TVs only output stereo sound via optical, so to get proper Dolby Digital 5.1 your set-top box or DVD/Blu-ray player will need to do the decoding, and be connected directly to the Playbar. So should you by a Playbar at all? Well if what you’re after is simply great movie sound there are perhaps better options, such as the Yamaha YSP-2500 which offers one of the more convincing virtual surround sound experiences available. But if you’re looking for a simple device that will massively improve the sound from your TV (as opposed to a bona fide surround sound set-up) and give you immediate access to more music than you could ever possibly hope to listen to, the Sonos Playbar is an excellent option. The main alternatives come in the form of other Sonos speakers; the Playbase is a soundbase for under your TV rather than a soundbar, but we're not quite as enamoured with the sound, while the Sonos Beam is a more compact, excellent sounding smart TV speaker, complete with voice control. Find out more in our in-depth Beam vs Playbar vs Playbase feature.